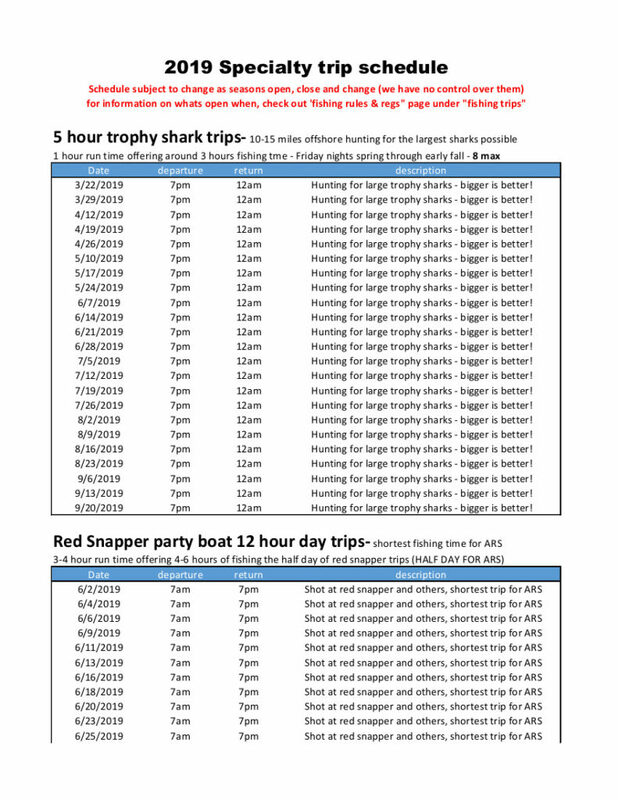 Our Specialty Fishing Trip Schedule are available for a PDF download but you are MISSING A LOT if you just depend on that. We schedule new trips WEEKLY! If you are not on our mailing list or on our Facebook page you are missing some great fishing. These photos just show you a little bit of the great catches that we go after. You cannot beat Hubbard’s for the biggest producing trips – We are the Best! If you’re too busy to go fishing, then you’re just too busy! You may now book reservations for all of our famous trips through our state of the art Online Reservations system on our Web Site. We’ve made it quick, easy and secure to book your trip with us 24 hours a day! Please note that online reservations are payable at the time of booking with a Visa or MasterCard, and are NON REFUNDABLE, unless we cancel due to weather, mechanical, or lack of minimal fare requirements. Use the calendar below to select your date and book online!